At the moment, no book is more visible or abundant at the gift shop of the National Archives in Washington, D.C., where more than a million visitors a year come to view the earliest copies of America’s founding documents, than Our Declaration—the most recent work by Danielle Allen, Ph.D. ’01. The title, appealing boldly to a spirit of national wholeness, is so prominent that it’s easy to overlook the argumentative note in its smaller subtitle: A Reading of the Declaration of Independence in Defense of Equality. Allen, a recently appointed professor of government and director of Harvard’s Edmond J. Safra Center for Ethics, writes that in the past century, equality has been pushed to the side—by philosophers, politicians, and laypeople—in favor of its sibling, liberty: “I routinely hear from students that the ideals of freedom and equality contradict each other.” She rejects this notion that liberty and equality are on a seesaw, that one can rise only at the expense of the other. Instead, she contends, “Equality is the bedrock of freedom.” Her evidence? The Declaration of Independence, read line by line as a masterpiece of plain-language philosophy. The Declaration’s authors, she contends, were far from being libertarians in the modern sense. To the contrary: they were proud and eloquent egalitarians. “These days too many of us think that to say two things are ‘equal’ is to say that they are ‘the same,’” writes Allen. But this is untrue: “To be ‘the same’ is to be ‘identical.’ But to be ‘equal’ is to have an equivalent degree of some specific quality.” Allen sees in the Declaration a careful case that the specific quality in question—what she calls “the fundamental feature of human equality”—is the ability to judge what makes one happy. We are all equal in our ability to judge our own happiness. It is only on top of thisbasic premise that the founders were able to build their argument for independence: we are free to decide what government we want to have because government is a means to securing happiness—the happiness which each of us is equally well qualified to judge. Our Declaration was praised by magazines as ideologically different as Dissent and National Review, and colleagues have responded to it as a serious work of political thought. But Allen didn’t write it to intervene in academic political philosophy. Instead, it grew out of her experience teaching the Declaration in night classes at the University of Chicago to people with busy lives, children, sometimes multiple jobs. That Allen is concerned with reaching sixth-graders at all sets her apart from most contemporary political philosophers. Our Declaration is only the beginning of the project: Allen is convinced that philosophers can affect the way the world works by rewiring the ideas with which we think and speak. Plato did this, she argues in one book. And the Declaration’s authors wrote with philosophical rigor for the broadest possible audience—“a candid world,” in their own words. If rehabilitating the concept of equality in today’s candid world involves not just writing books and giving lectures, but also designing video games and tweeting, then Allen will do so, engaging on every front she can. Reading Our Declaration offers a window into the life of its author—both because Allen writes a good deal about her own life and upbringing, and because her approach to scrutinizing the Declaration pulls together the diverse elements of her intellectual life. The book is a textual commentary, a genre used chiefly by classicists. Allen majored in classics at Princeton; received her first doctorate, in classics, from Cambridge, where she was a Marshall Scholar; has written at length about Athenian democracy and Plato; and taught in Chicago’s classics department for 10 years, serving as dean of the humanities for three. It is a work of political philosophy as well. After her time at Cambridge, she completed her second doctorate, in government, at Harvard (while still teaching classics at Chicago). That dissertation yielded the ambitious yet compact Talking to Strangers: Anxieties of Citizenship Since Brown v. Board of Education (see here); the MacArthur Foundation, citing the book, awarded her a “genius grant” in 2001, when she was 29, for her work in both political theory and classics. At the Institute for Advanced Study, her academic home from 2007 to mid 2015, she served on the faculty of the School of Social Science. Back at Harvard, in her current joint appointment with the Graduate School of Education, she works on the philosophy of education. Iconic self-sacrifice and courage in face of “cleavage and division”: Elizabeth Eckford integrates Central High School, Little Rock, 1957. The style of Our Declaration captures certain aspects of what it’s like to talk with its author. Allen has an easygoing demeanor and a wide smile, yet speaks with a flowing urgency in neatly structured, lucidly reasoned paragraphs that suggest she could have dictated her books in a single well-considered draft. “I believe that the language of the Declaration of Independence does give us a lot of what we need by way of symbolic supports for a commitment to equality,” she explains in her Safra Center office. Allen believes that the Declaration operates not just on the deliberative plane analyzed by many political scientists, but also serves as what she calls prophetic speech— “language which engages with our values and our commitments,” in the mold of Martin Luther King Jr.’s speeches and writings. Our Declaration aims to rely on the “existing resource” of the Declaration to try to revive the nation’s commitment to equality. In a January-February 2016 essay for Foreign Affairs building on the work of Michael Walzer, Ph.D. ’62, Allen acknowledges that there are several kinds of equality—moral, political, social, economic—that must be balanced in a “virtuous circle,” where each feeds the others. “Political equality ultimately rests not on the right to vote or the right to hold office but on the rights of association and free expression,” she writes. But the same rights that are necessary for human dignity also inevitably generate and protect the wealth disparities of capitalism and certain kinds of social discrimination. As a result, she believes society needs structures that help avoid the emergence of phenomena, like a caste system or economic exploitation, that undermine the basic project of political equality. Politically engaged: Plato discourses with Aristotle in this detail from The School of Athens, by Raphael, 1509-1511. That range of sources has become a hallmark of her writing about and beyond classics, demonstrating her belief in the importance of rhetoric, sensitive critical attention to works of art and literature, and, most of all, her conviction that normative philosophy—philosophy that addresses questions of “What should we do?” or “How should we act?”—is not merely a theoretical endeavor, but can make practical interventions in a dynamic society. The final section of Prometheus analyzes Plato and Aristotle’s respective attempts to challenge and reform the Athenian understanding of punishment, specifically by developing new conceptual vocabulary for thinking about the issue: in Plato’s case, by using words for making sense of punishment as correction; in Aristotle’s, by examining what it means to “deserve” a punishment. Allen’s 2010 book Why Plato Wrote, which grew out of lectures delivered at the University of Bristol, advances that project a step further. Her vision of Plato as an intellectual fully engaged in an attempt to transform his political community, who wielded language with tremendous artfulness as his chief tool for changing minds, challenges the long-held vision of many readers that sees Greek philosophers as willfully detached from public life: Socrates shunning politics to preserve his own virtue, Aristotle contrasting lives of contemplation and politics. Allen also proposes a vision of what a modern political philosopher might hope to do, and how. She sets Plato’s notorious attack on writing in the Phaedrus against his defense of writing as a philosophical tool in the Republic, and from the argument implicit between the two works, constructs a vision of how Plato justified his literary endeavors. Allen argues that in Plato’s view, language and writing are vital parts of human life, but some symbols lead toward knowledge, others away from it—so the philosopher has a responsibility to traffic in good symbols. Moreover, by constructing models with those symbols and then recording them in writing, the philosopher can convince readers to act as if they knew the truth, and eventually lead them down the road to actually knowing it. But that’s only the first blow in the book’s one-two punch. Allen proceeds to argue that Plato wrote with the motive of affecting his contemporaries’ actual political behavior—and that he succeeded in doing so. Having examined the surviving speeches concerning the Athenian response to the rise of Macedon in the fourth century b.c., she builds an elaborate argument (hinging at points on minute particulars of historical events) that defies easy summary but leads her to conclude that technical vocabulary from Plato’s teachings and writings percolated into fierce policy debates. Adherence to Platonism, she contends, became grounds for suspicion in the political contests involving some of the city’s most famous orators: Demosthenes, Aeschines, Lycurgus. She draws from this “culture war” a pointed lesson that pushes back against the materialist interpretation of ancient Greek history (prominent in the mid-twentieth century), which emphasized economic and social realities as the basis of cultural phenomena. Rather, Allen vigorously maintains that ideas have the potential to be independent sources of change. From Allen’s undergraduate days to the present, many students have reacted against the bodies of literature that most engage her—ancient literature and political theory—as an unrepresentative procession of white men. 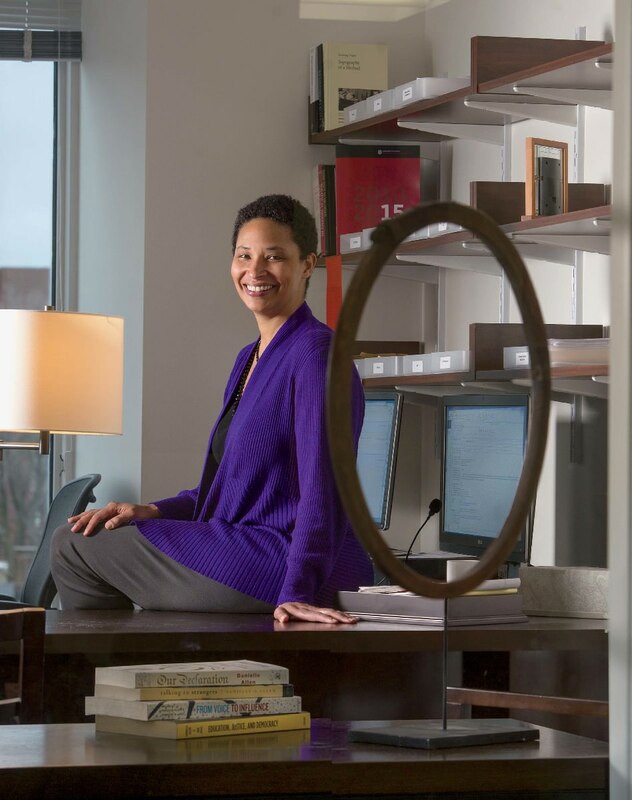 Allen stands out in the context of both classics and political theory as a talented and visible academic who also happens to be a black woman—a professor to whom an undergraduate feeling marginalized on account of gender or race might look for guidance. For all her professional training in ancient history and philosophy, Allen’s intellectual self-identification rests elsewhere and, she says, always has. In a brief essay for Critical Inquiry in 2004, she wrote, “I have always thought of myself first as an analyst of politics and second as a literary critic”—an unusual conjunction of roles. She names as her heroes George Orwell, Hannah Arendt, and Ralph Ellison, all of whom had “a combination of literary sensibility and political acuity” to which she aspires. In her view (which fits nicely with her reading of Plato), politics is made, substantially, out of words, so any interpreter of politics has to engage with the rhetorical quality of public life—a quality which seems all the more important at the current moment in American politics. Both her political and literary sides have roots going back to childhood. Allen writes briefly in the early chapters of Our Declaration about growing up in a household saturated with books, thanks to her Latin-loving father and her mother, Susan, a librarian. “In my childhood, at an early point, we twice read the Bible through from start to finish,” she writes—out loud, one chapter per night. When she was seven, her family moved to France for a sabbatical year, and she was allowed to take two books: both of hers were volumes of poetry. “I don’t know how I knew this, but I knew that they would just last me longer,” she says. Her love of poetry has been lifelong: dismayed to find that the University of Chicago had no poetry series, she created one, inviting students, South Side residents, and career poets into the same space to read their work. Allen’s father was politically active when she was growing up, serving first on the National Council on the Humanities, and then as chair of the Commission on Civil Rights for an extremely turbulent 14-month period late in the second term of President Ronald Reagan and the early George H.W. Bush administration. A 2013 profile in The Guardian characterized her as quite conservative well into her undergraduate years; she was an intern at National Review. By her account, it wasn’t until the summer of her junior year that contemplating statistics on income inequality in America led her to reconsider her political beliefs, beginning what would become a major transformation. As a commentator, Allen stands out among progressive writers for her even-handedness and generosity toward conservatives. She has been unsparing about the candidacy of Donald Trump—though she will argue with rationality and great restraint with individual Trump supporters—but her columns otherwise contain little in the way of the gripes, insults, or insinuations about Republicans destroying the country in which some liberal op-ed writers traffic. Past columns on issues like government power and drug policy take pains to build middle ground between left and right. Her writing reads like the product of a more civilized, less polarized time, when American communities were sufficiently purple that people generally thought about how their words would make their neighbors—or relatives—feel before they spoke in public. The same equipoise is evident in Allen’s theoretical writing. She describes her 2004 book Talking to Strangers, which grew out of her second doctoral dissertation, as a work “about how you develop healthy civic relationships—trust-generating civic relations—in the context of demographic cleavage and division.” Talking to Strangers begins by analyzing an instance of what Allen calls “trustworthiness”: Elizabeth Eckford, in an act of self-sacrifice and courage, earning respect and trust by walking, nonviolent but determined, through the jeers of a mob in front of Central High School in Little Rock in 1957. The book is ambitious in theoretical and historical scope, engaging with thinkers from Aristotle and Hobbes to Arendt and Habermas—and including an elegant reading of Ellison’s Invisible Man as a work of social theory. At barely 200 pages, it is what the intellectual historian Quentin Skinner once approvingly called a “small book about big things.” (It may also be the only work of political theory with an admiring cover blurb from Toni Morrison.) Allen argues that Brown v. Board of Education was, in effect, a constitutional re-settlement: the national understanding of citizenship and its attendant rights was transformed. But that settlement was not accompanied by a solid consensus about how the nation might frankly address differences—religious, cultural, linguistic, but especially racial—that involve substantial sacrifice by groups within the democracy for the health of the nation as a whole. In Allen’s vision, democracy necessarily entails sacrifice: in any contentious decision, some groups of citizens win while others lose. That means democracies need good ways to moderate, acknowledge, and appreciate those sacrifices, while assuring reciprocity of sacrifice in the long term. How is this possible? Allen crafts her solution out of materials drawn largely from Aristotle. She thinks that citizens in a democracy should think of themselves as friends, not out of love, but out of utility: they are in a project together, and that project works best when they can presume each other’s good intentions. And rhetoric (a good thing, she insists) at its best can forge that trust, making it possible to talk to strangers as equals, respecting what they have to give, and signaling a willingness to give in return. Even in 2004, the book’s argument provoked some skeptical reactions: what about people who just want to be offensive or domineering, or benefit from the disempowerment of other groups—and whom no amount of reasoning will change? Talking to Strangers looks even more sanguine when seen against the background of everything that has happened since its publication: Trayvon Martin, the death of immigration reform, Ferguson, Charleston, Mizzou, the incendiary and exclusionary rhetoric of the current presidential primary campaign. Allen stands by her conclusions. She believes that strong institutions matter here—that “the more a society’s institutions generate the possibility of the formation of bridging ties across cleavages and lines of difference, the more likely it is that the society will have egalitarian outcomes in domains like health, the labor market, education and so forth.” Where trust and rhetoric are concerned, she argues that even though citizens have a responsibility to show themselves to be trustworthy, a free society can’t make them speak respectfully. But, she adds, “You can call out problematic behavior in an assertive way without yourself becoming untrustworthy,” when dealing with intentionally offensive citizens, who often seem not to understand that their right to offend others doesn’t immunize them from objections to their own speech. Allen’s appointment at Harvard’s Safra Center this past fall, a year before its thirtieth anniversary, was in keeping with the institute’s original concerns: how to connect moral theory with ethical practice. Founded in 1986 as the Program in Ethics and the Professions, it was envisioned by former Harvard president Derek Bok as a means to bring philosophers into dialogue with professionals, starting within the University, but quickly reaching, he hoped, into the world at large. It was Harvard’s first program to bridge schools internally, as well as the first major interdisciplinary ethics initiative at any university. As director, Allen succeeds Lawrence Lessig, Furman professor of law and leadership, who for five years led the Center in an extended laboratory-style project of research into the problem of institutional corruption. Talking to Strangers led Allen to her current role at the education school. To her mild surprise, one of the biggest audiences for the book turned out to be teachers: “I discovered that the things I was working on—about healthy social interactions, civic relationships, generating trust in conditions of diversity—are front-and-center for K-12 teachers. So ever since then, I’ve had one foot in that pedagogical world.” Education and Equality attempts to lay out a comprehensive philosophical justification for schooling. She proposes that the economic and egalitarian benefits that societies (and their politicians) seek from education—higher individual incomes and national productivity, along with greater social mobility and equality of opportunity—can best be assessed and structured by pursuing education because it enables full human development, as understood along the lines of Aristotle’s concept of eudaimonia: activity of mind in accordance with excellence. It’s another enormous project streamlined into a slim volume. Different kinds of educational challenges await as well. Concerned about her failure to reach a middle-school audience with Our Declaration, Allen is in the early stages of developing a video game about the Declaration of Independence. “It’s a genre, like a book or poem—it’s just a different form for intellectual and aesthetic expression,” she exclaims. “I’m learning a lot right now!” The challenge lies in finding a way to create a game that can teach its players how to read closely, and how to see the conceptual architecture of the Declaration: the idea of premises leading to a conclusion, and how a conclusion like equality then serves as the foundation for further insights. “The Declaration turns around this notion that we are pursuing our individual and collective safety and happiness, and makes a very strong argument about the building blocks that are necessary for those things: rights and good government, equality and liberty,” she points out. One can imagine how those building blocks might literally fit together—how they might be joined in a kind of philosophical Minecraft. It’s symbol-work, Allen says, of the kind Plato engaged in. “All adults should read the Declaration closely; all students should have read the Declaration from start to finish before they leave high school,” she proposes at the end of Our Declaration. If this newest project succeeds, maybe she’ll beat her own expectations and lower that age to eighth grade. Meanwhile, she estimates that only half the undergraduates at the highly selective colleges where she has taught have read the Declaration in full. In response, her fervor to get every American to read the same 1,337 words carefully (achievable or not), and her faith that doing so might help save the nation, set forth a vision in which close reading can empower, philosophical reasoning can inspire, and history can recall the country to its loftiest ambitions. Spencer Lenfield ’12, a former Ledecky Undergraduate Fellow at this magazine, lives in Washington, D.C. He profiled poet and translator David Ferry, Ph.D. ’55, in the May-June 2015 issue. He has also reviewed books for Slate and published poems in the Colorado Review.